Open for lunch and dinner, specializing in fresh seafood, steaks and sandwich platter. At lunch you can get daily specials, which offers 1 meat, two sides. They also offer over 12 different sandwich platter and several side. At dinner you can get a wide variety of seafood. You can choice from their selection of fried dishes, such clams, oysters, shrimp, flounder, whiting, deviled crab, and scallops. 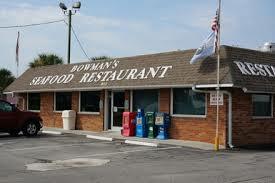 Or you may be looking for the boiled shrimp, Alaskan Snow Crab Legs, and broiled flounder. Make your seafood plate a combo with any of the listed seafood. Someone with you not a seafood lover, well they have that covered also. Try their ribeye steak, hamburgers steak, Bar-b-Que or chicken strips. We enjoyed a “Sailor’s Seafood Combo” with fried shrimp, flounder, slaw and baked potato. Great food, outstanding service!